Nowadays night and day observation cameras are installed everywhere, sometimes they are even equipped with microphones. They transmit signals of multiple frequency ranges from 1,2 GHz up to 5,8 GHz. In order to detect and display these hidden wireless cameras we have developed our PKI 5770 Full Band Video Scanner which scans 1.2 GHz, 2.4 GHz and 5.8 GHz frequency bands synchronously within 30 seconds up to a distance of 100 m. It is equipped with NTSC or PAL/SECAM for identification of detected video signals. By means of the STOP/SCAN button the image can be latched or released. The speaker will display the voice if there is an audio signal with the wireless camera signal. 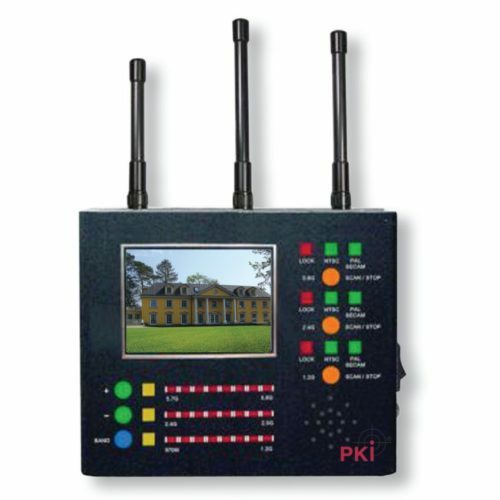 PKI 5770 offers 3 STOP/SCAN buttons for each frequency band and video system indicator. Furthermore it provides 3 Audio/Video outputs for recording of signals from 3 frequency bands at the same time.